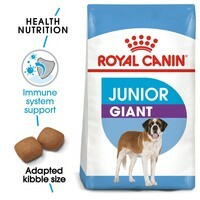 Royal Canin Giant Junior Dry Food for Dogs is a complete and nutritious food for large breed puppies from 8 to 18/24 months old with an adult weight over 45kg. Developed specially to help your puppy during the important stage of their life when they begin to gain bulk and build muscle mass, the food has been made with only high quality ingredients including vitamins and minerals to provide optimum nutrition. Digestive Health: An exclusive combination of nutrients to support optimal digestive security (L.I.P proteins) and a balanced intestinal flora which also contributes to good stool quality. Bone & Joint Support: Contributes to good bone mineralisation in giant breed puppies thanks to a balanced intake of energy and minerals, thus supporting bone consolidation and joints. Muscle Development: An adapted protein and L-carnitine content to help support muscle development in giant breed puppies during the second growth phase from 8 months old. Natural Defences: Helps support the puppy’s natural defences, thanks particularly to an antioxidant complex and manno-oligo-saccharides.